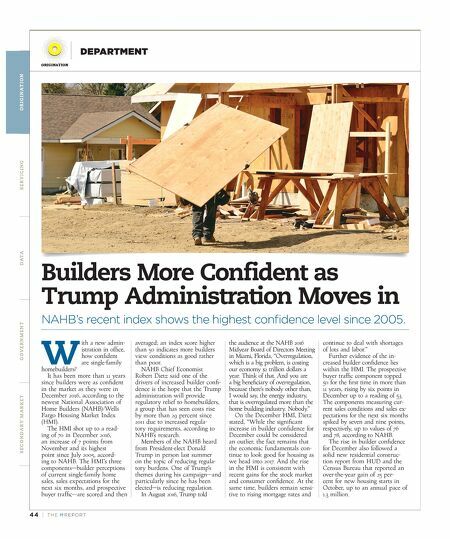 44 | TH E M R EP O RT O R I G I NAT I O N S E R V I C I N G DATA G O V E R N M E N T S E C O N DA R Y M A R K E T DEPARTMENT ORIGINATION Builders More Confident as Trump Administration Moves in NAHB's recent index shows the highest confidence level since 2005. W ith a new admin- istration in office, how confident are single-family homebuilders? It has been more than 11 years since builders were as confident in the market as they were in December 2016, according to the newest National Association of Home Builders (NAHB)/Wells Fargo Housing Market Index (HMI). The HMI shot up to a read - ing of 70 in December 2016, an increase of 7 points from November and its highest point since July 2005, accord - ing to NAHB. The HMI's three components—builder perceptions of current single-family home sales, sales expectations for the next six months, and prospective buyer traffic—are scored and then averaged; an index score higher than 50 indicates more builders view conditions as good rather than poor. 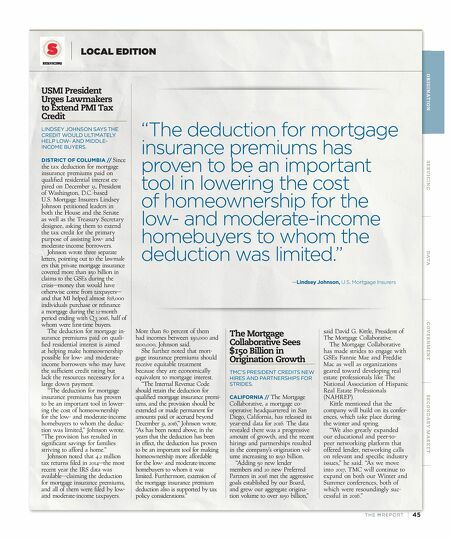 NAHB Chief Economist Robert Dietz said one of the drivers of increased builder confi - dence is the hope that the Trump administration will provide regulatory relief to homebuilders, a group that has seen costs rise by more than 29 percent since 2011 due to increased regula - tory requirements, according to NAHB's research. Members of the NAHB heard from President-elect Donald Trump in person last summer on the topic of reducing regula - tory burdens. One of Trump's themes during his campaign—and particularly since he has been elected—is reducing regulation. In August 2016, Trump told the audience at the NAHB 2016 Midyear Board of Directors Meeting in Miami, Florida, "Overregulation, which is a big problem, is costing our economy $2 trillion dollars a year. Think of that. And you are a big beneficiary of overregulation, because there's nobody other than, I would say, the energy industry, that is overregulated more than the home building industry. Nobody." On the December HMI, Dietz stated, "While the significant increase in builder confidence for December could be considered an outlier, the fact remains that the economic fundamentals con - tinue to look good for housing as we head into 2017. And the rise in the HMI is consistent with recent gains for the stock market and consumer confidence. At the same time, builders remain sensi - tive to rising mortgage rates and continue to deal with shortages of lots and labor." Further evidence of the in - creased builder confidence lies within the HMI. The prospective buyer traffic component topped 50 for the first time in more than 11 years, rising by six points in December up to a reading of 53. The components measuring cur - rent sales conditions and sales ex- pectations for the next six months spiked by seven and nine points, respectively, up to values of 76 and 78, according to NAHB. The rise in builder confidence for December also followed a solid new residential construc - tion report from HUD and the Census Bureau that reported an over-the-year gain of 25 per- cent for new housing starts in October, up to an annual pace of 1.3 million.